My friend Annie, at work today, whooshed past me as I was waiting to scan and send some recommendation letters. She turned back and said, “Do you want to do some cooking with strawberries?” My mind was far away from cooking at that moment and I wasn’t even sure I had heard her correctly, so I weakly smiled and dumbly nodded and she walked away. But I do, I do want to do some cooking with strawberries, still. We have had strawberries for several months, now. All winter I associated strawberries with the tonic flavors of winter: fennel, leeks, spinach, and citrus. By the way, I never get tired of that combination and we still have fat, ox-blood colored berries trying to catch our attention in the entryways of the produce stalls and I still cannot resist them. Strawberries, however, are verging on a danger zone for me. It’s May now and a mythical place called Whatcom County, Washington is beginning to awaken from its dormancy in my brain. I am pretty effective at cryogenically freezing that attachment when I have to be away all year, but I’m past the winter season here and the next encounter with strawberries will be in Washington and we will be right back into the shortcakes, jam, and I hope this summer, ice cream and then we will be with our sons, and our other side friends and family, worshipping the Strait of Juan de Fuca, and the violet, solstice sunsets. This was a recipe I piloted during the cook-a-thon that was the month of April. It is from Donna Hay who, God bless her, keeps everything as simple as can be. Even working with pastry. I also love her committed use of vanilla beans with strawberries and it is a combination I insist on now, too. This comes together easily and don’t think twice about buying puff pastry from the store which means, do that. I am an advocate of making a lot of things at home, but puff pastry is not one of those things. I’ve tried. Warning, these boil over so bake them on a lined baking sheet. Preheat oven to 400 degrees F. Place the butter, sugar, water, and vanilla in a small nonstick or glazed pan over medium heat and stir until the sugar is dissolved. Bring to the boil and cook for 2-3 minutes, remove from the heat and compost the vanilla bean. 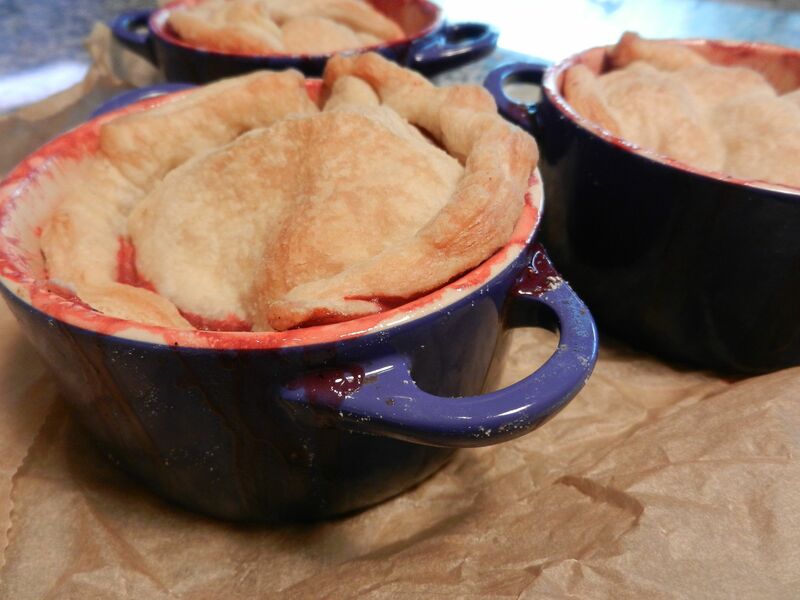 Divide the strawberries between 4 x 3/4 cup capacity, lightly greased muffin tins or mini-cocotte pans and pour over the caramel. Roll the pastry out on a lightly floured surface to 1/4 inch thick. Cut circles 1/4 inch wider than the form you are using and place on top of the strawberries. Bake for 20-25 minutes or until golden. Invert onto plates and serve with whipped cream or creme fraiche. < Previous What Happened to Ottolenghi?